Posted June 30, 2014 by Sue Peffer & filed under News. Cambridge, UK – 30th June 2014 – Cresset, innovative provider of computational chemistry software and services, announces the release of Torch V10.3. 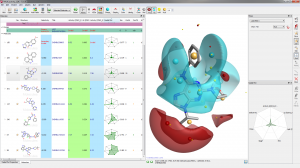 This version includes significant new science enabling medicinal chemists to visualize and optimize multiple activities to make the best molecular design decisions. Find new chemical intellectual property using Cresset’s Blaze directly from your desktop. Submit or retrieve the results from in-house or cloud hosted ligand-based virtual screening experiments directly from Torch.